Looking for a quick gift that will keep on giving during the holidays? Then look no further than a Fruit of the Loom fleece sweatshirt! I recently was sent two Fruit of the Loom fleece sweatshirts to review and love both of them. I have been wearing my navy blue sweatshirt even when it is considered to be freezing outside. I love how warm and soft these sweatshirts are. My daughter actually took over one of the sweatshirts because she loved how soft and warm it keeps her. They come in an array of colors and sizes. One cool thing about Fruit of the Loom products are that they are so affordable. You can find these sweatshirts at your local Walmart or at Walmart.com. 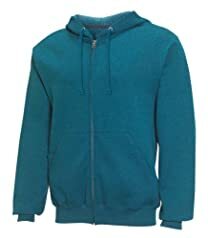 Here is the link to the Fruit of the Loom Best Collection Fleece Hooded Pullover Sweatshirt I received and the Fruit of the Loom Best Collection Fleece Full Zip Hooded Sweatshirt that my daughter has now taken over. The Best Collection Fleece Sweatshirts would be a great gift for anyone of your family members. The fleece sweatshirts I received were for men, but I personally prefer the fleece sweatshirts from the men's section. You can buy a Fruit of the Loom fleece sweatshirt in women's and children's as well! Awesome products at affordable prices for everyone in the family.